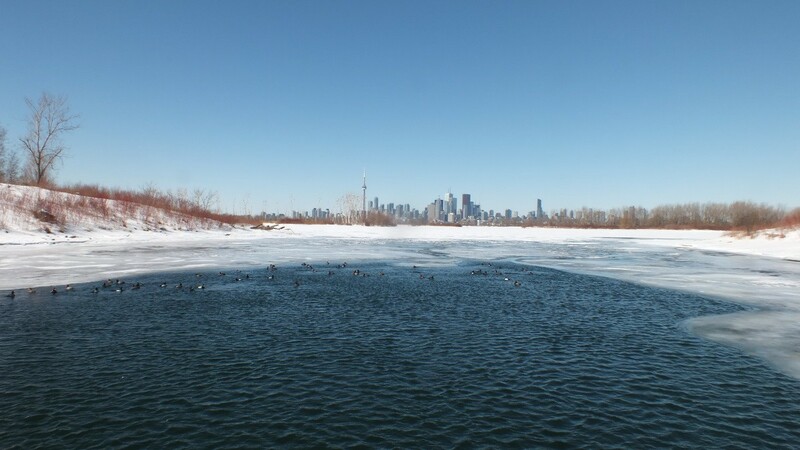 It isn’t as if Bob and I have never seen Long-tailed Ducks (Clangula hyemalis) before, previously known as Oldsquaws, but on one visit this spring to Tommy Thompson Park, we noticed something quite unusual about this female as it swam near the lift bridge on the Leslie Street Spit. Venturing out along this man-made peninsula was a totally enjoyable experience even though it required walking a full 5 kilometres on slippery, wet snow that still covered the trails and walkways. The day was warm and windy as spring days go, and we were grateful to be outdoors basking in the sunshine. 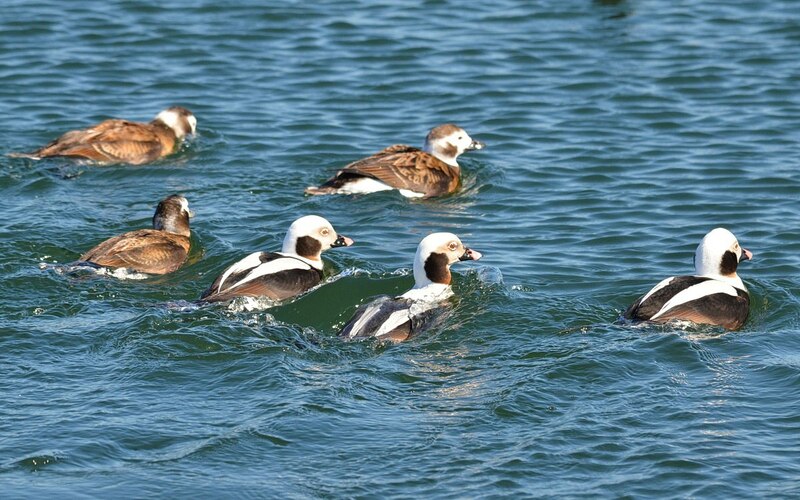 A plethora of ducks was lingering near the lift bridge that joins one part of the peninsula to the other, and immediately, the Long-tailed Ducks caught our attention with the white on their heads gleaming in the noonday sun. 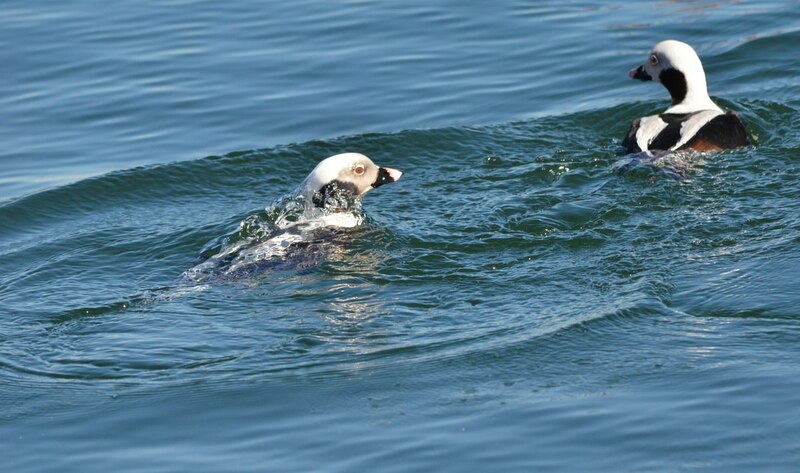 We were highly entertained by the Long-tailed Ducks as they dove repeatedly in search of mussels. It was fun trying to predict where they would next pop up. You could see them swimming well below the surface, but they propelled themselves so quickly that I found it impossible to capture any underwater sequence before they would bob up like corks to the surface of the water. It was easy to distinguish the males from the females, the drakes from the hens, not only by their colouring but also by the long, black central tail feathers of the males that poke out perkily from their tail end. The thing that seemed odd, though, was one female had a similar projection dangling from the back end of her body. 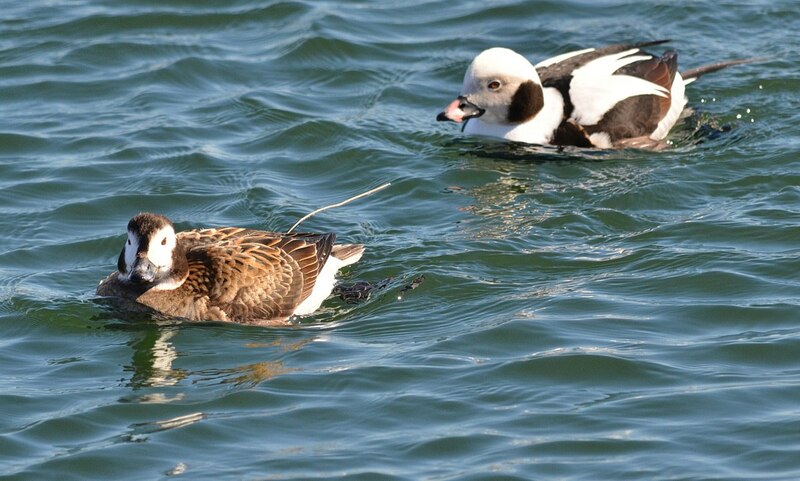 I have to admit that, when Bob and I first saw this particular female Long-tailed Duck, we thought perhaps a stick or wire had become tangled in its plumage. Concern started to percolate, but whatever it was did not seem to detract from the attention of the drakes, nor did it infringe on the movements and behaviour of the hen. At home, a bit of research on my part led me to believe that an electronic tracking device had been implanted in the hen’s body. With a bit of digging, I located the 2014 State of the Birds report authored by a team of scientists from the North American Bird Conservation Initiative (NABCI) wherein they list Long-tailed Ducks as a common bird on their watch list because this species is rapidly declining throughout its range. More than 50 percent of the global population has been lost over the past 4 decades. I further went on to uncover detailed information about efforts made by Long Point Waterfowl to understand the types of habitats that Long-tailed Ducks use. Long Point Waterfowl is based near Port Rowan, Ontario, and their primary area of study is conservation of waterfowl and wetlands throughout the Great Lakes region. 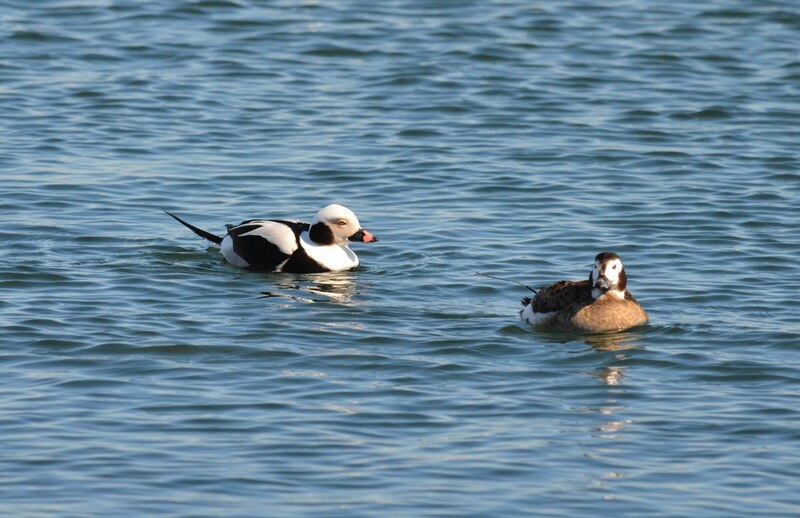 In their estimation, over the past twenty-five years, larger numbers of sea ducks such as Long-tailed Ducks have been observed on Lake Ontario during migration and during the winter months. 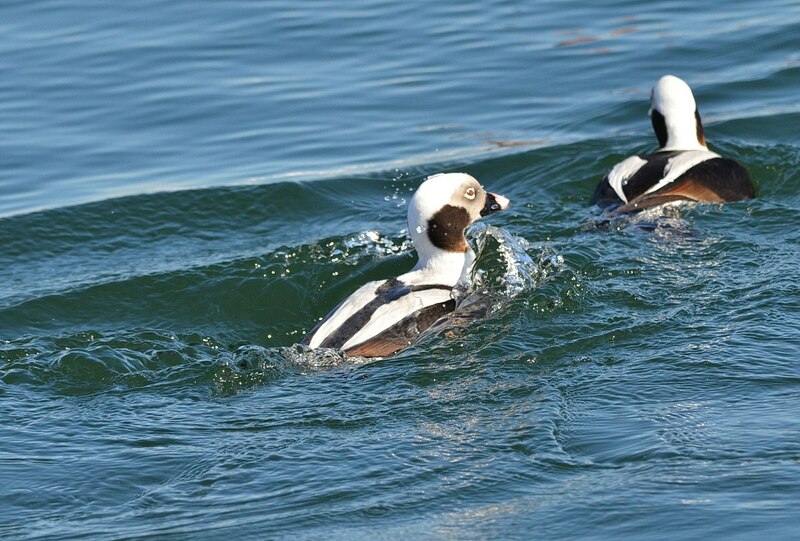 To make informed recommendations for future conservation plans that will impact Long-tailed Ducks, it was necessary to gather data about the ducks’ movements by using the ducks themselves to gather the scientific data. 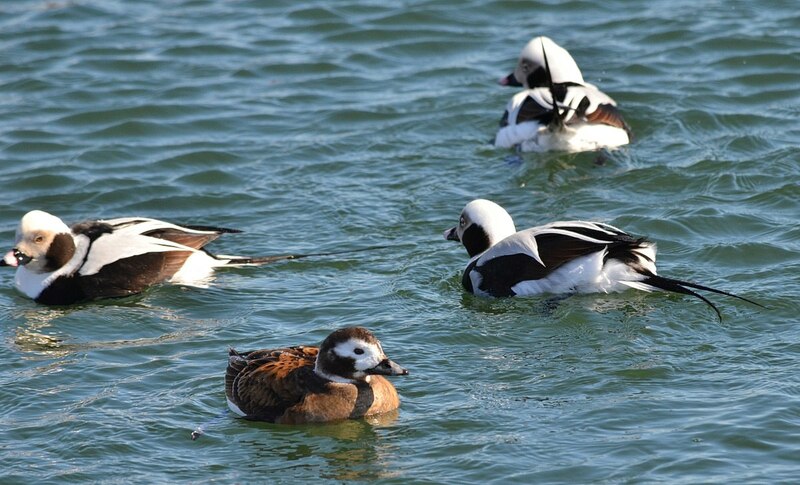 Because Long-tailed Ducks use both nearshore and offshore areas of Lake Ontario during the winter months, a method had to be put in place to gather data about their offshore activity. That is where satellite telemetry comes into play. 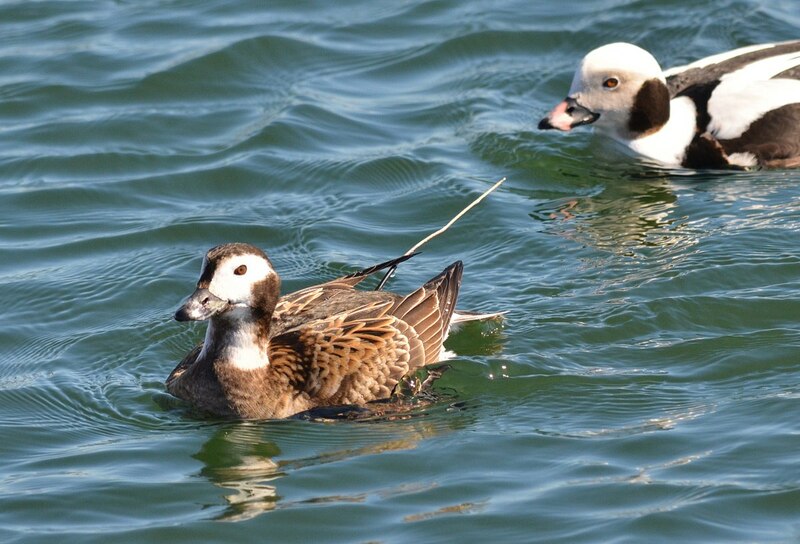 Long Point Waterfowl did not act independently but collaborated with Canadian Wildlife Service to capture and band 314 Long-tailed Ducks during the winter and spring months of 2010-2013, and of those, 74 adults were selected to have satellite transmitters surgically-implanted in their bodies. Veterinarians from the U.S. Geological Society and the Toronto Zoo assisted the researchers with implanting transmitters in 51 hens and 23 drakes. 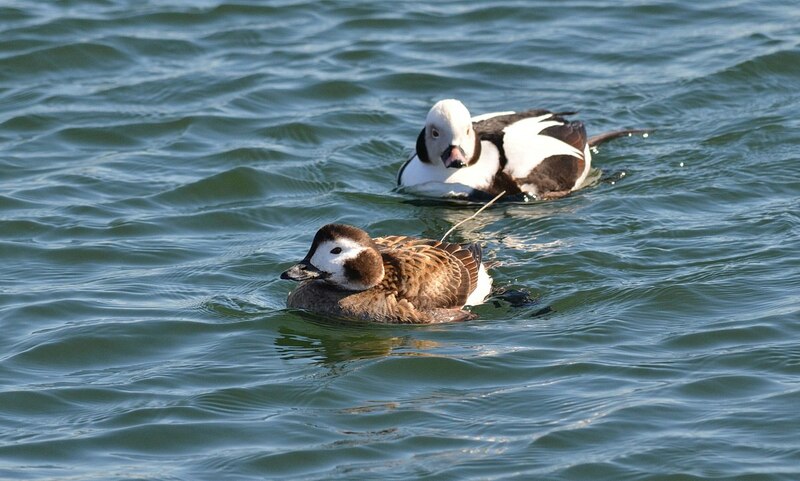 Satellites orbiting Earth were able to track the implanted Long-tailed Ducks to determine where on Lake Ontario they wintered. The study also involved Sea Duck Joint Venture since they had a broader research program in place to uncover details about migration, breeding and moulting areas. 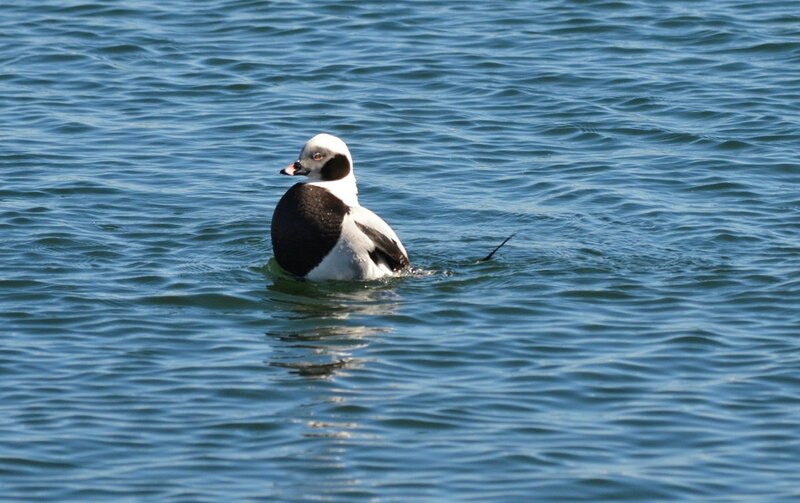 The information gathered from the marked ducks will assist in determining where wind turbines should be erected in Lake Ontario to have the least impact on Long-tailed Ducks. I am most grateful to Dr. Scott Petrie, Executive Director, Long Point Waterfowl, and Philip Wilson, MSc Candidate and Primary Investigator, for permitting me to spread the word about their work, providing a link to their 2014/15 Newsletter, and explaining that, having been implanted a few years ago, all transmitters have now reached their life expectancy, and dead batteries mean data is no longer generated. 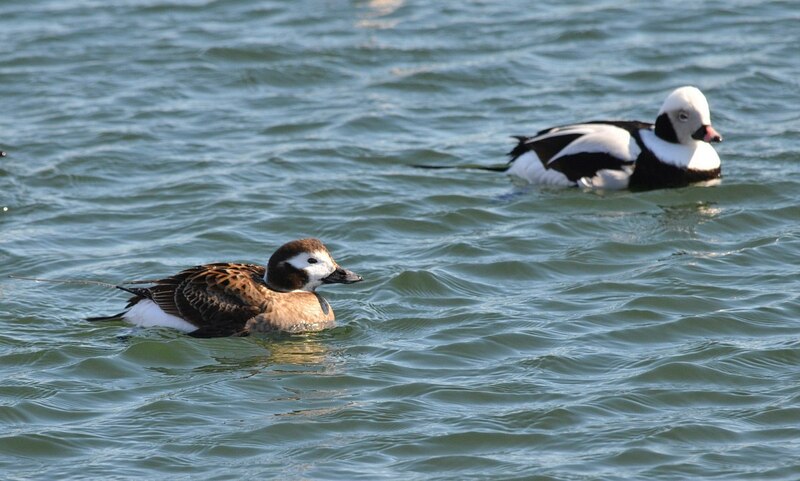 It was interesting to learn that no other group has entered into a study using satellite telemetry on Long-tailed Ducks, so this female is known to have been banded in either Toronto Harbour or Hamilton Bay. 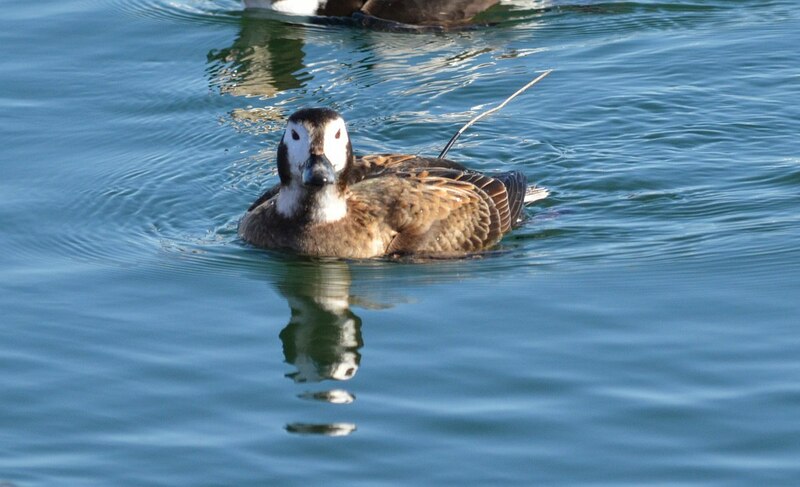 I had hoped to determine the band number for this specific female Long-tailed Duck, but as it is, I learned more than I ever expected about the only Long-tailed Duck that we’ve ever seen sporting a satellite transmitter even if it is now defunct. how utterly amazing this is? I would have panicked, wondering what on earth was sticking out of her backside. Great info. When at first Bob and I spotted the transmitter poking up from the duck’s backside, we did have a moment of panic. Taking a closer look with the binoculars, we could see that whatever it was seemed to be purposefully and well attached, so that got us doing some research into what it could be for. We found the details fascinating.